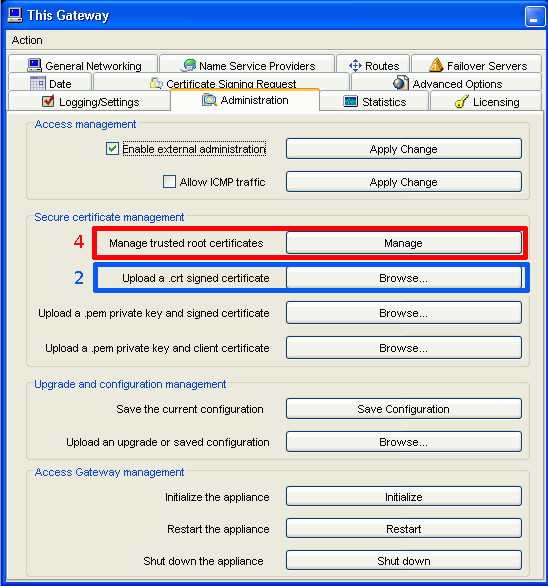 Citrix Access Gateway SSL installation must be done through the Administration Tool. Select the Access Gateway Cluster tab and then open the window for the appliance. Click Browse and navigate to the yourDomain.crt file. Then browse to your yourDomain.ca-bundle file. Note: If you just received individual .crt files, please follow our instructions on how to make your own .ca-bundle file. Once these files are supplied on this same window click the Restart button next to Restart the appliance. Congratulations you have installed your SSL certificate onto Citrix Access Gateway!